ow I saw in my dream, that they went on, and GREAT-HEART went before them; so they went and came to the place where CHRISTIAN'S burden fell off his back and tumbled into a sepulchre. Here, then, they made a pause; and here also they blessed God. "Now," said CHRISTIANA, "it comes to my mind what was said to us at the gate; to wit, that we should have pardon by word and deed: by word, that is, by the promise; by deed, to wit, in the way it was obtained. What the promise is, of that I know something; but what is it to have pardon by deed, or in the way that it was obtained? Mr. GREAT-HEART, I suppose you know? wherefore, if you please, let us hear your discourse thereof." ow I saw, still in my dream, that they went on until they were come to the place that SIMPLE and SLOTH and PRESUMPTION lay and slept in when CHRISTIAN went by on pilgrimage; and behold, they were hanged up in irons a little way off on the other side. hus they went on till they came at the foot of the hill Difficulty; where again their good friend, Mr. GREAT-HEART, took an occasion to tell them of what happened there when CHRISTIAN himself went by. So he had them first to the spring. "Lo," saith he, "this is the spring that CHRISTIAN drank of before he went up this hill, and then 'twas clear and good; but now 'tis dirty with the feet of some that are not desirous that pilgrims here should quench their thirst". Thereat MERCY said, "And why so envious trow?" But said their guide, "It will do, if taken up, and put into a vessel that is sweet and good; for then the dirt will sink to the bottom, and the water come out by itself more clear." Thus, therefore, CHRISTIANA and her companions were compelled to do. They took it up and put it into an earthen pot, and so let it stand till the dirt was gone to the bottom; and then they drank thereof. Next he showed them the two byways that were at the foot of the hill, where FORMALITY and HYPOCRISY lost themselves. And said he, "These are dangerous paths; two were here cast away when CHRISTIAN came by. And although, as you see, these ways are since stopped up with chains, posts, and a ditch, yet there are those who will choose to adventure here, rather than take the pains to go up this hill." Chris. "The way of transgressors is hard". 'Tis wonder that they can get into those ways without danger of breaking their necks. Great-heart. They will venture; yea, if at any time any of the King's servants doth happen to see them, and doth call unto them, and tell them that they are in the wrong ways, and do bid them beware of the danger: then they will railingly return them answer, and say, "As for the word that thou hast spoken unto us in the name of the King, we will not hearken unto thee: but we will certainly do whatsoever thing goes out of our own mouths," etc. Nay, if you look a little farther, you shall see that these ways are made cautionary enough; not only by these posts, and ditch, and chain, but also by being hedged up: yet they will choose to go there. Chris. They are idle, they love not to take pains; the uphill way is unpleasant to them. So it is fulfilled unto them as it is written: "The way of the slothful man is a hedge of thorns". Yea, they will rather choose to walk upon a snare, than to go up this hill and the rest of this way to the city. Then they set forward, and began to go up the hill, and up the hill they went; but before they got to the top, CHRISTIANA began to pant, and said, "I daresay this is a breathing hill; no marvel if they that love their ease more than their souls choose to themselves a smoother way." Then said MERCY, "I must sit down"; also the least of the children began to cry. "Come, come," said GREAT-HEART; "sit not down here, for a little above is the Prince's arbour." Then took he the little boy by the hand, and led him up thereto. When they were come to the arbour, they were very willing to sit down; for they were all in a pelting heat. Then said MERCY, "How sweet is rest to them that labour! And how good is the Prince of pilgrims to provide such resting places for them! Of this arbour I have heard much; but I never saw it before. But here let us beware of sleeping; for as I have heard, that it cost poor CHRISTIAN dear." Then said Mr. GREAT-HEART to the little ones, "Come, my pretty boys, how do you do? 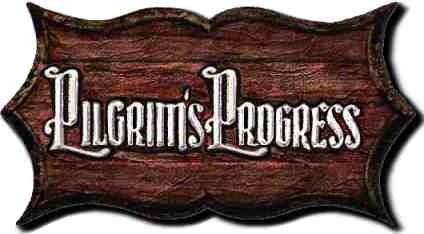 what think you now of going on pilgrimage?" "Sir," said the least, "I was almost beat out of heart; but I thank you for lending me a hand at my need. And I remember now what my mother has told me, namely, 'That the way to heaven is as up a ladder; and the way to hell is as down a hill.' But I had rather go up the ladder to life, than down the hill to death." Then said MERCY, "But the proverb is, 'To go down the hill is easy.'" But JAMES said (for that was his name), "The day is coming when, in my opinion, going down hill will be the hardest of all." "'Tis a good boy," said his Master; "thou hast given her a right answer." Then MERCY smiled; but the little boy did blush. Chris. "Come," said CHRISTIANA, "will you eat a bit, a little to sweeten your mouths, while you sit here to rest your legs? For I have here a piece of pomegranate which Mr. INTERPRETER put in my hand just when I came out of his doors; he gave me also a piece of a honeycomb and a little bottle of spirits." "I thought he gave you something," said MERCY, "because he called you aside." "Yes, so he did," said the other; "but, MERCY, it shall still be as I said it should, when at first we came from home; thou shalt be a sharer in all the good that I have, because thou so willingly didst become my companion." Then she gave to them, and they did eat, both MERCY and the boys. And said CHRISTIANA to Mr. GREAT-HEART, "Sir, will you do as we?" But he answered, "You are going on pilgrimage, and presently I shall return; much good may what you have do to you. At home I eat the same every day."